One thing that keeps me awake at night is the thought that something will break in the original motor of my 1919 T and it will be destroyed. My paranoia was enflamed when one of the guys at the Central NH T club told me that I should consider replacing the two piece valves because they were prone to coming apart. More fuel was added when someone else mentioned that his T was not working because of a slight problem with a two piece crankshaft. When I learned that a rebuilt motor was nearby and available I began thinking that it might be a good idea to get a spare so I could drive the T while the original one was being rebuilt. 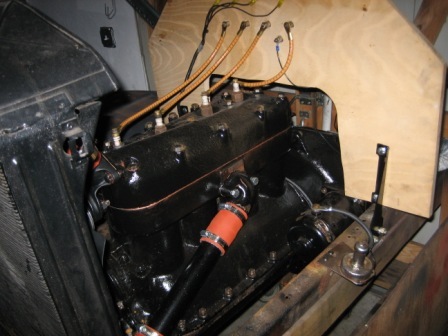 To make the story short – I now have a rebuilt 1926 motor (made on Nov 8, 1926) and transmission with everything except the timer ready to put in the 1919. It has .030” over, aluminum pistons, a re-built coil ring, stainless valves, new rear main bearing cap, and new pins bushings and Kevlar bands in the transmission. It even has a generator and starter - whatever they are. It was a pleasure talking and dealing with the guy that sold it to me and he even helped by loading it on his truck and delivering it to me. I got to see it run on the battery and mag on the test stand before I bought it. LOOK MA! No water pump!! Yes replace the 2 piece valves, I had one come apart on me on it dropped in cylinder and punch a hole in #2 piston(iron). It happend when I was driving and my first thought was I threw a rod. New valves are inexpensive. It is alright, Fred. Most of us have that feeling occasionally. And, sometimes it happens. Often, it becomes the story you share around parking lots in the evenings around the hotel. 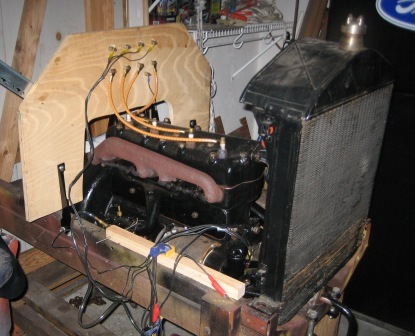 You will most likely have to make temporary floorboards to use the '26 engine. Otherwise it should work fine. If your original engine does still have the two-piece valves? I would replace them soon. The older they get, the more likely they can fail badly and soon. I didn't trust them forty years ago because I knew several people that had them come apart. As for the rest of the engine. That is up to you. Some of the nicest running Ts I know are "freshened up" original engines. However, many people disagree with me and have good reasons to do so. Fred, I believe a backup engine is a good thing, especially when one has more than one T. For me, it is easier to swap out an engine and enjoy the sunshine and save the drudgery work for a rainy day. Think of a backup engine as a temporary fix. Keep smiling and enjoy the ride. I have a 15 Touring, 20 Roadster (both re-built engines-so probably don't have them) and '25TT with what appears to be an untouched engine. Tim ; As far as i know , the valves with the two holes are the two pieces . You can see it , if you take out the sparkplugs . Hey Tim, I believe if you are careful and have a small, bright flashlight, you can remove a spark plug and should be able to see the head of the valve if you are standing on the driver's side of the engine and crouched down. 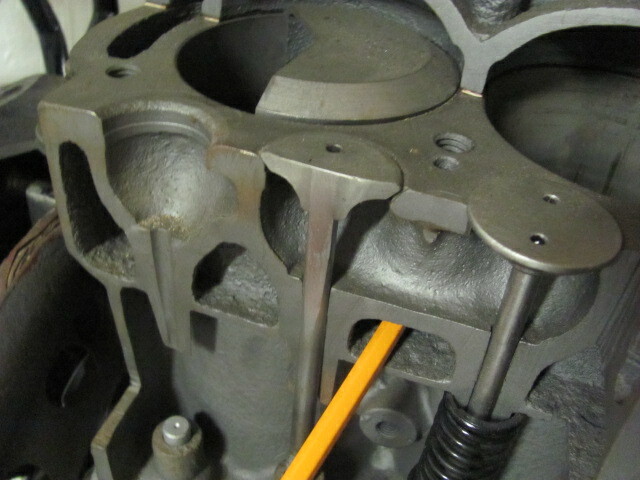 The two peice valves have holes in the top for a tool to attach and lap them. I don't think any one piece valves have this feature. Here's a thread where I got that picture. There are others to look at. Two Cents. The two dimples in the valves were used for lapping in the valve and the seat. Can't give specific example, but have seen dimples before for other makes. THANKS you guys!! Wow, what a fast response! I really really appreciate all that I keep learning here, and those pics definitely help...a picture IS worth a thousand words! I'll be pulling spark plugs tomorrow when it's near 80 out! Only 45 right now...I'm a wimp, it's too cold in the barn for that!! I do not think the dimples have anything to do with the valve construction. 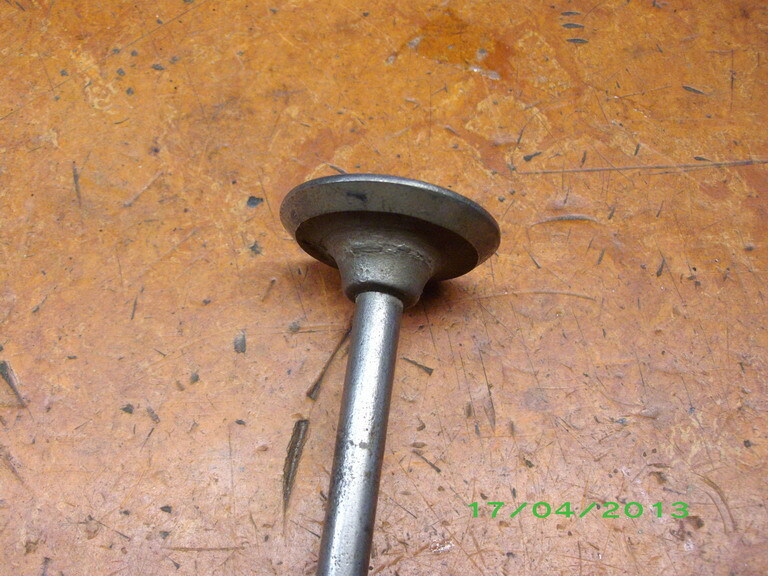 As others stated, they are used to attach the valve lapping tool. Can anyone confirm dates when they changed to one piece construction? One piece steel valves were introduced just about the same day the last cars were produced - maybe some trucks were produced after car production stopped, with one piece valves? Spare engines made after car production stopped up until the last one was made in 1941 certainly got them. Engine 15,000,000 built this date. 14,999,999 to 15,000,001 were held out of May 25 production. The last number built May 25 was 15,002,217. All-steel valves now used in all engines except those for export. "A special all-steel valve for Model T cars and trucks is now available through service stock, and in order to effect a complete initial distribution of this product to all dealers, we will include a small quantity with your next parts order. "This all-steel valve is very much superior to the present type valve and we therefore recommend its use in your repair and service work." I got a good buy on a rebuilt 26 short block and also had a 26/27 transmission. So when my 24 crankshaft broke at 40 mph and annihilated the block I just happened to be prepared. When you put in that 26 engine, you will really like the wider pedal spacing, and the better brake band. While you are at it, add a 26/27 rear axle and then you will have a real emergency brake also. Ted, not paranoid but prepared, albeit accidentally. The two pinholes, or a long slot, are indeed for a valve lapping (turning) tool to connect to. 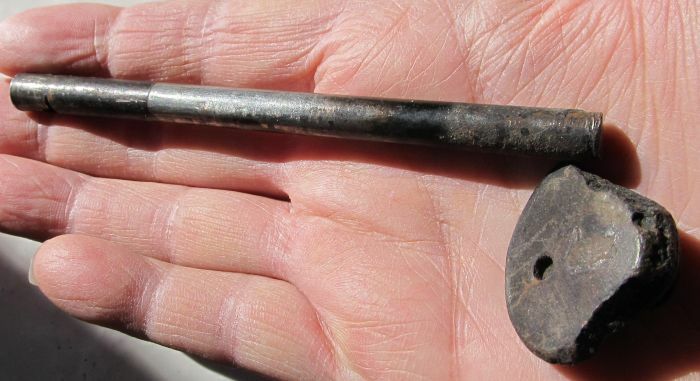 I think all model T two-piece valves had the two holes. However, after-market one-piece valves were available fairly early. Many of them, as well as later replacement one-piece valves, also had either the holes or slots. I do use those when I have them. Actually, the term "one-piece valves" is a misnomer. 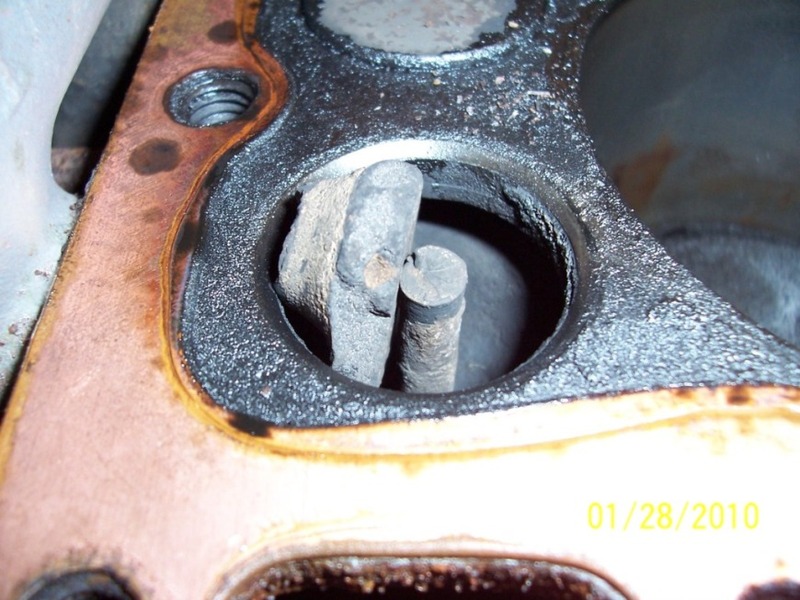 Probably more than 99.99% of all automobile engine valves made in the past fifty years are made from two pieces. The difference is that the two pieces are welded together. 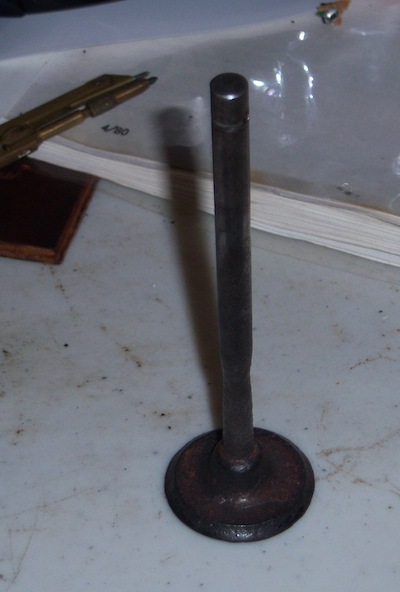 Whereas the model T (and other early) valves have cast iron heads cast onto steel stems. Some of the problems include vibration and constant hammering creating and worsening looseness, dis-similar thermal reactions between the head and stem, and age/moisture encroachment. ANY looseness or rust forming between the stem and head will result in the head breaking or simply falling off in very few miles. There are very few upgrades I consider necessary to drive a model T more than a very little bit. Over forty years ago, I decided on replacing Babbitt thrust washers and two-piece valves plus adding a brakelamp. Those are the same three I feel the need for today. Although I will admit to liking vintage added brakes. One of Bruce McCalley's rules was "Two piece valves are only good for throwing away". Enough said. When I took the valves out of my '24 Touring, all of them had the two holes on top. However, some of them were the two-piece valves, and some were one piece. Either way, they were shot and needed to be replaced. Here's one of the two-piece ones, just for y'alls enjoyment. Keep in mind that the engine was running with valves like this! Yeah, for sure you need to get rid of those 2 piece valves replaced the minute you purchase your T. I've still got the 2 piece valves in my sedan and they've only held up for 87 years. With them displaying that kind of Mean Time Between Failures and haven't shown an overly aggressive exponential failure curve yet I feel it's essential to get after them and change them immediately. 2 pictures above show 2 different metals in the 2 piece valves. That would be how you tell. I have to strongly disagree with your 99.99% number, and more strongly yet when it concerns intake valves! Sorry to resurrect this, but I have a question. While doing the refresh on my '14s engine, I kinda want the ability to use use a valve lapping tool that fits the two holes on top of the original valves (which I have, as well as the tool) If someone had good valves, could someone braze the valve head to the stem for insurance? At least for exhaust valves, they will run too hot for brazing to hold up. It would just melt off. You should be able to find better valves with the lapping holes. Do they make reproductions with said holes? 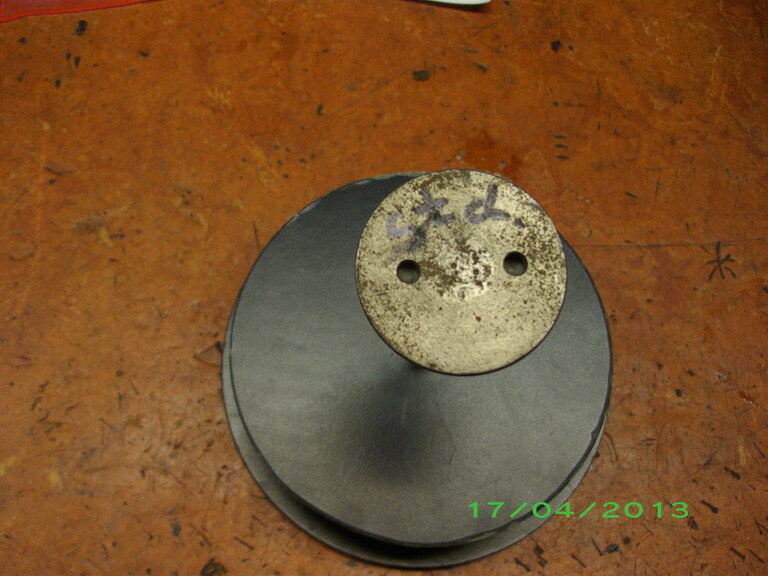 Just change the head piece on your lapping tool to a suction cup.It will work fine for lapping valve seats by hand. I just though the original type tool was cool, so I was trying to figure out how to keep it functional the way it is. I'm not saying I'm going to be using it, but I enjoy authentic ness . 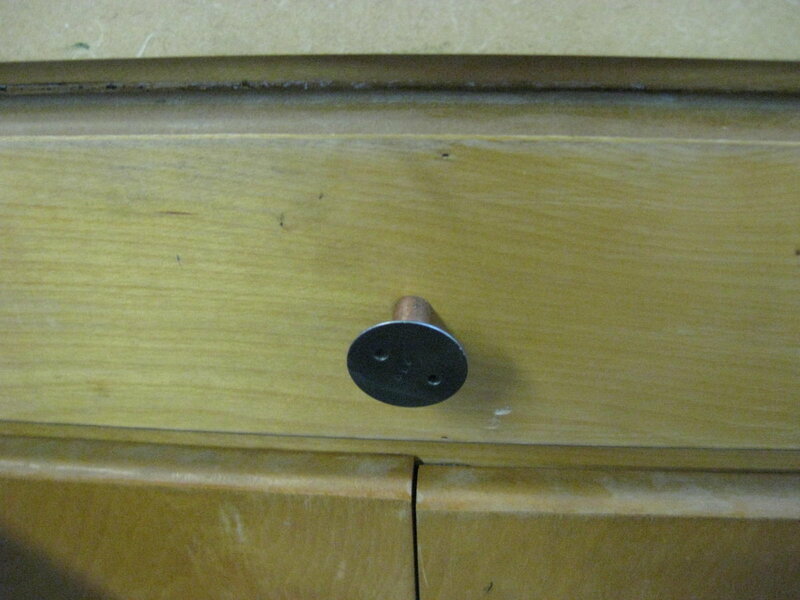 Clayton - Now that I look at your photo more closely, it looks like maybe that actually "IS" a drawer pull! If so, great idea! If the valve dont have a slot or dimples, just take your dremel with a cut off wheel and cut a light slot for your slotted lapping tool to go in. Suction cups dont stick worth a hoot for me sometimes so this is what I do.Most new vavle are clean and smooth and the cup will stick.But old rough valves,not so well. no names no pack drill. No one has mentioned this, but I think you can look in or feel the valve stem and valve head connection through the manifold ports. Maybe if you remove the manifolds you can tell if you have two piece valves. That would save pulling down the engine if the compression is still good. I always use a hand lapping tool when assembling an engine--just a light "swipe" to insure that I'm getting full contact & that it's not too wide. Is lapping done in lieu of grinding or is lapping part of the valve resurfacing process? David - "Lapping" does not "attain a narrow band", to use your words. In my estimation, the only way to attain a narrow valve seat is with the 30-45-70 deg. method, commonly referred to as a "three angle valve job"! And this type of valve seat is actually, at least in Model "T" Ford terms, a fairly modern practice. And "lapping" actually removes almost no material but for the most part, merely addresses the surface texture of the existing valve seat and valve face. It might be noted that an excellent method of cutting (notice I said "cutting" and NOT "grinding") a new valve seat is by use of carbide cutters with modern equipment instead of "grinders", which cut an excellent and precise valve seat, and also leave a surface texture that the company that makes the cutters I use claims to be what they consider to be a perfect texture for the valves to seat quickly and perfectly when the engine is first started up, or "run-in" after a "valve job". Most of the "non triple angle" valve jobs had a face and seat cut 1 degree different. As in 45 degrees for the valve and 44 degrees for the seat. That gives the "small band" you refer too. I was driving to work one morning several years ago in a 1922 roadster pickup truck we have since sold when an exhaust valve gave up the ghost a few blocks from work. I was able to limp along to work where I pulled the head and found what was left of the valve. I was lucky no damage was done to anything but the valve. At lunch break I had someone drive me home where I grabbed A handful of used valves and returned to work. I was able to find one that fit within reason and was able to drive home in the T that afternoon with no further problems. I drove that T for another two years without doing any further valve work on the car before I sold it. Here's what was left of the valve. Never did find the rest of the pieces. Caution - 2 pc. valves seem to come from together ! The rest was in the muffler ! You prove that you can do almost anything to keep a T running and most of the time it will be OK. Ts are rugged little guys that far exceed the Energizer Bunny or Timex watches. When one of the Model A guys was talking with me about the motor that is stuck he said "Loosen it up and drive it. The motor is low compression and hard to hurt." Odd the way they break. In Seth's cutaway photo it looks like the shaft goes almost to the top of the valve head yet they seem to let go just under the head. I assumed they pulled out not snapped. I don't often post but do read this forum daily.Reading this forum answers questions before you have the problem. On this occasion I can contribute a tip. Last year when lapping valves I was having a problem, the suction cup would not stick to the valve head, I had a major cerebral tsunami (brain storm) hot glue the cup to the valve head! worked great and with a little heat the glue cleaned right up. By the way I've seen a lot of discussion regarding correcting typos , misspelling etc. I had no difficulty making 6 corrections. 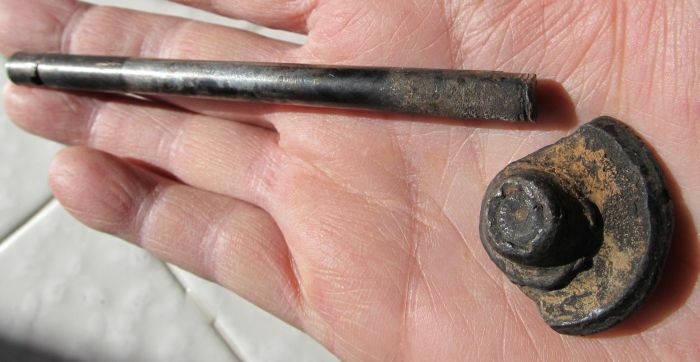 Charlie B - in Jays excellent photo you can see the shaft had corroded right under the head. Lost material there causes a trigger for metal fatigue. Guess that's why the 2 piece valves seems to be more break prone now than back in the day.